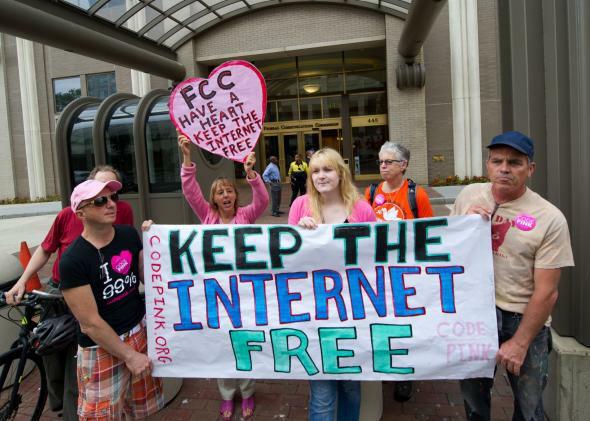 Polls show that Republicans and Democrats both want net neutrality, no fast lanes. A protest to support net neutrality in May. On Monday, President Obama came out in strong support of net neutrality and advised the FCC to reclassify Internet service as a utility under Title II of the Telecommunications Act. Later that day, FCC Chairman Tom Wheeler, an Obama appointee and former cable/telecom lobbyist, met with tech company representatives to say that he did not plan to follow all of the president’s proposals. Sounds about right. When he entered the fray, though, Obama knew that he had almost 4 million supporting opinions on his side from the FCC public comment period on net neutrality. (Thanks, John Oliver!) And polling is backing this assessment up. A new survey by the University of Delaware’s Center for Political Communication showed broad support for net neutrality across age, gender, education, and race demographics. The survey, which had a margin of error of 3.2 percentage points, found that roughly 81 percent of Americans oppose “fast lane” deals brokered by Internet service providers. And when you break that number down by party affiliation, 81 percent of Democrats and 85 percent of Republicans were opposed to fast lanes. And as Time points out, though some Republican lawmakers like Sen. Ted Cruz, R-Texas, House Speaker John Boehner, R-Ohio, and House Majority Whip Steve Scalise, R-La., all came out strongly against Obama’s net neutrality stance, other polls agree with the one conducted at University of Deleware. One by the Internet Freedom Business Alliance found, with a 2.8 percentage point margin of error, that about 83 percent of voters who self-identified as “very conservative” didn’t want ISPs to have power over online content. And 83 percent of conservatives thought that Congress should be able to take action against ISPs that could “monopolize the Internet or reduce the inherent equality of the Internet.” The IFBA is a pro-net neutrality lobbying group, so take their study with a grain of salt. But the group’s leader is former Rep. Chip Pickering, R-Miss., so maybe the issue really does reach both sides of the aisle.